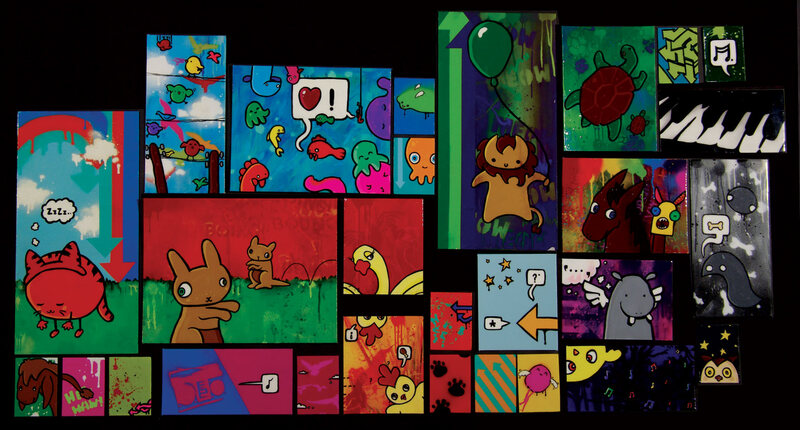 I explored the 'untraditional’ styles of art-making, cartoons and graffiti. There is no reason why art can’t be vibrant and youthful. I’ve always had an affinity with street art and culture and I view these practices as valid forms of art-making. I’ve also been heavily influenced by illustrators, in particular Shaun Tan. My animals are based on a piece of music called Le carnaval des animaux (The carnival of the animals) by the French Romantic composer Camille Saint-Saëns. All my backgrounds are painted using stencils and spray paint to connect my work to modern practices and my characters are all created using acrylic paint. My final process was to add a liquid gloss to the finish. I had a lot of fun in the creation of this work and I believe it is shown in the finished product.